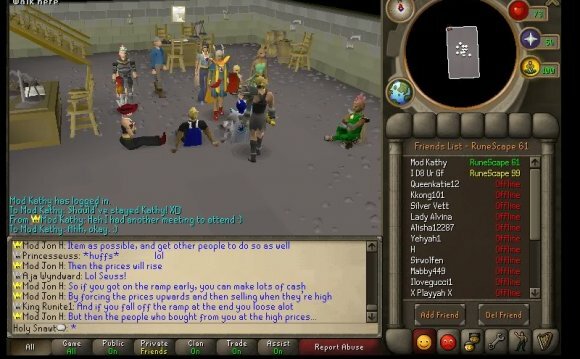 Player Moderators have been a part of RuneScape for over 10 years now, and throughout those 10 years the role has continued to change and evolve to meet the demands of the ever maturing and growing community. Earlier this year, we launched three PMod groups; Game Helper Team, Social Media Team & Events Support Team. These groups are available for Player Moderators to sign up to, with each group offering a particular service or extra support to the community. Player Moderators are all about helping support the community, focussing heavily on engagement & events, with that being their primary focus. Of course some Player Moderators may not feel inclined to join a team, which is of course fine, as they still remain a Player Moderator, simply not assigned to a specialist group. In addition to the above groups, we also support a team of PMod Mentors who act as friendly neighbours to newer PMods, helping them understand the PMod tools and guidelines, as well as acting as a point of contact with any questions they may have. * Note – this page is for information purposes only, there is no way to distinguish whether a PMod is involved in a group or is a mentor, except for asking them! The PMod Game Helper Team is slap bang in the middle of everything happening in game. Game Helpers are passionate about providing useful in game information, helping our newer players out, advising those who seem a bit lost and being a great point of helpful, friendly contact. Like all Player Moderators, Game Helpers are there to support the community, but have opted to specialise in this particular area, and receive regular contact & support from Jagex. The Social Team is at the very heart of our social media journey. Social Team PMods are invited to help us with our own social media campaigns, receive regular support from Jagex and even have a dedicated line through to Mod JD, our in house Social Media Manager. Social Media PMods get what hashtags are all about, they know the lingo and love putting ‘@’ before player names! This team is all about creating, attending and supporting awesome player powered in game & forum events. They’re at the heart of encouraging player lead events, helping those who wish to give creating events a go, as well as creating their own awesome events for you to all enjoy. Event PMods have access to an events calendar where they collaborate with Jagex, and regularly communicate their event schedule to us to allow for promotion and more. Each team is supported by both Jagex and appointed Team Champions. Team Champions are PMods who have expressed an interest in helping support their team, acting as an ambassador for their group, and working closely with Jagex to make improvements wherever possible. Get ready for more cat-astrophic adventures as the wily Pink Panther stows away on a ship, waits tables, evades a tax collector and hits the slopes in this delightful collection of 27 classic animated shorts!